How does your voice subtly alter as you are introduced to foreign royalty? When you kneel before your sovereign, if you summon the courage to speak, does your voice crack, or assume the volume of a whisper. The research involved interviews with potential employers (most likely because too few individuals with royal blood were available). We found that vocal modulations were apparent between responses to the neutral and high-status targets, with participants . . . increasing fundamental frequency. C.S. Lewis was a gifted orator, who could well have served as the prestigious participant in a study such as this. “Lewis had a rich, deep, booming voice,” notes a recent volume. This may be one reason that Adolf Hitler rued Lewis’ contribution to the Allied war effort. There are a bevy of studies related to how all manner of things exert a subconscious effect on our vocal pitch. For example, you may not be aware that “Japanese women modify their pitch when reading English sentences, producing speech in a slightly lower pitch range” (Japanese Language, Gender, and Ideology). Another fact of which you may be unaware, is that on the Supreme Court of the United States, “when male justices respond to female justices, they are more likely to raise their pitch.” What’s more, as the years pass, “female justices lower their voice pitch over time, whereas male justices raise their voice pitch over time.” What do we make of that? In an article about how “study after study has suggested that low voices, ‘masculine’ voices, are an asset to those seeking leadership roles, in politics and beyond,” we discover how this relates to women, as well. We perceive men with lower-pitched voices to be more attractive and physically stronger–and also more competent and more trustworthy—than their less burly-voiced peers. And we perceive women with lower-pitched voices along the same lines (though we also tend to perceive them, tellingly, as less attractive than their Betty Boop-y counterparts). The portion of the essay which is pertinent to the subject of the current column is the way he introduces the Dream Lecturer, but praising the “voice and figure” of its human precursor. None of this [i.e. the evolution lecture], of course, was new to me or to anyone else in the audience. But it was put very well (much better than it appears in my reproduction) and the whole voice and figure of the lecturer were impressive. At least they must have impressed me, for otherwise I cannot account for the curious dream I had that night. In “The Decline of Religion,” Lewis praises open and uninhibited conversations about faith. In contrast, he describes an earlier age of superficial religiosity in which Christianity, “if it had to be spoken of, it was spoken of in a hushed, medical voice.” Ah, the medical voice. We who have been around hospitals and sickbeds (for those seriously ill) are quite familiar with that somber and muted tone. In “Meditation in a Toolshed,” Lewis illustrates the distinction between studying something and peering more deeply into it. His description of the voice of one’s beloved is quite poetic. Reading these words, I am reminded of the Song of Solomon. Fortunately, we possess a small number of recordings of Lewis’ voice. Sadly, however, many more were lost. During WWII, the BBC used twelve-inch metal disks coated with acetate for recordings. But because metal was in short supply, those disks were primarily reserved for field recording, so only one of Lewis’s WWII talks was preserved. If a sufficient number of recordings had survived, an analysis of Lewis’ voice pitch might have earned a modern graduate their PhD. It is fitting to close these thoughts with a thoroughly Lewisian quotation. Lewis was a deeply charitable man. In his writings he mentions a number of times how he strove to put the best face on the words and actions of others. In a letter to one of his regular correspondents who is extremely “distraught” at another’s behavior, he urges patience. In doing so he mentions how we can become so prejudiced toward others that their very voice becomes a bludgeon. But read on and see how he makes his gracious point. It is a pity he ‘gets on your nerves’ but you are, rightly, controlling your reactions. I know well how a person’s very voice, looks, and mannerisms may grate on one! I always try to remember that mine probably do the same to him—and of course I never hear or see myself. War is a terrible thing. It should be avoided at (nearly) all costs. As C.S. Lewis wrote during Hitler’s atrocities, “If war is ever lawful, then peace is sometimes sinful” (“The Conditions for a Just War”). I was writing this weekend about one of the sad consequences of war—the creation of orphans. As an adopted child of God, I possess deep compassion for children without parents in this world. Over a decade ago I was privileged to represent the United States Air Force at the dedication of the Korean War Children’s Memorial. The war in Korea was horrific. The frontlines swept across the peninsula, leaving desolation and tragedy in their wake. The number of orphans created by the violence was legion. In the cruel ebb and flow of the conflict, many perished. Still, even in the crimson terror there were expressions of mercy and grace. Chaplains often led the way in reaching out to the children, but their efforts would have accomplished little if the compassion of the common Soldier, Marine, Sailor and Airman had not moved them as well to make sacrifices to care for the children. Chaplains who serve in Korea today have maintained the strong bonds of support for orphanages that was so vital to the wartime chaplains represented by Blaisdell. During my year in Taegu (Daegu), I coordinated the ministry of the airmen at Taegu Air Base in partnership with Love and Hope Orphanage. Love and Hope has a unique role, caring for the least of the least . . . children with serious physical and/or mental handicaps. There is little room for them in most societies, and Korea is no exception. Orphans are made not by war alone, of course, but by a variety of tragic confluences of suffering. Some lose parents to accident or disease. Today, we find the greatest number of orphaned children in various parts of Africa where AIDS has devastated local adult populations. Similarly, following natural disasters such as major earthquakes and tsunamis, many orphans are left alone in the rubble or receding waters. Some children flee abusive homes, or are rescued from dangerous environments; in one sense these were orphans even before their legal bonds with cruel predators were severed. Many causes account for the existence of orphans. And, as long as we live in this fallen world, orphans will be among us. This is why we must never forget that, “Religion that is pure and undefiled before God, the Father, is this: to visit orphans and widows in their affliction, and to keep oneself unstained from the world” (James 1:27, ESV). In 1951, Lewis sent his friend a newly translated copy of the first book in his Chronicles of Narnia. He invited the priest (who would be canonized by the Roman Catholic Church less than fifty years later) to pass the book on to one of the orphans in his care. While I imagine the volume remained close to the future “saint,” I trust that Lewis’ powerful tale delighted many of the young children in his care. Jewish poetry is breathtaking. The Psalms have nourished people of faith, as well as secularists, for millennia. C.S. Lewis wrote this about the providence of God in using the Jewish people as his conduit for blessing the world. My enjoyment of the Psalms has been greatly increased lately. The point has been made before, but let me make it again: what an admirable thing it is in the divine economy that the sacred literature of the world should have been entrusted to a people whose poetry, depending largely on parallelism, should remain poetry in any language you translate it into. Thank you very much for the book. It has given me real help. What I particularly enjoy in all your work, specially this, is the avoidance of that curious drabness which characterises so many ‘little books on religion.’ Partly it is due to your Hebraic background which I envy you: partly, no doubt, to deeper causes. Things that particularly pleased me were the true meanings of Beloved (p. 8) and Son (p. 9), the whole account of the Transfiguration (pp. 16 et seq), the passage on Sacrifice (p. 32), the passage ‘This was a shock’ (on p. 35), on our inability to understand sin (41 and 47), the very important bit about Hebrew & Roman ideas of ransom (52, 53): the really splendid account of how God can’t help deceiving the devil (56) and the allegorical close. There are, in fact, a good many Gifford Lectures and other such weighty tomes out of which I’ve got less meat (and indeed less efficient cookery!). Jews and Christians have a complex relationship. This is even more true for Jewish people who come to accept Jesus as the promised Messiah. For most Jews, this automatically results in their expulsion from the Jewish community. However, for a growing number, there is a more gracious attitude developing. Here is the most surprising part of the survey. Thirty-four percent of American Jews consider believing Jesus is the Messiah, is compatible with being Jewish. Let me repeat that . 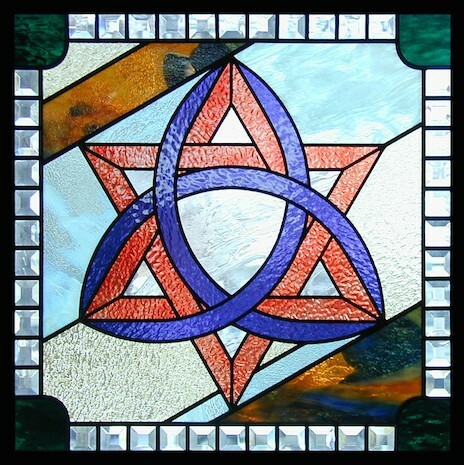 . . 34% of Jews in the United States (35% of the ultra-Orthodox Jews) believe that “Messianic Jews” remain Jewish. I find that amazing. I also find it encouraging, since it’s consistent with the understanding of the Jews in first century Judea who worshipped beside the followers of Jesus in Jerusalem until its fall. Some years ago I heard a lecture by a prominent Jewish theologian who described how historical Judaism rarely rejected those who considered any particular rabbi to be the Messiah. Apparently this remains true today, as some modern Jews, for example, consider Menachem Mendel Schneerson (1902-1994) to be the Messiah. Returning to the case of Jesus of Nazareth, the improving attitude is encouraging to see. In part, because most Messianic Jews say accepting Jesus as the Messiah has made them more Jewish. By that, most mean that they now practice the traditions of their Jewish heritage more faithfully than they previously did. Now as the whole idea of the “Will of the Lord” is precisely what the world owes to the Jews, the blaspheming tyrant has just fixed his absurdity for all to see in a single sentence, and shown that he is as contemptible for his stupidity as he is detestable for his cruelty. For the German people as a whole we ought to have charity: but for dictators, “Nordic” tyrants and so on . . .
All of the civilized people of the world share Lewis’ revulsion with Hitler and his agenda. In that we definitely agree with the vast majority of Jews who regard “Remembering the Holocaust” as something essential. As positive a sign as the 34% support of Messianic Jews remaining Jewish is, the survey includes a more sobering corollary. Exactly twice that number, 68%, agreed that you can remain Jewish even if you don’t believe in the existence of God. Shocking. But that’s a subject for another day. The word was introduced by Richard Dawkins in 1976 and means an idea or social behavior that is transmitted by repetition “in a manner analogous to the biological transmission of genes.” Dawkins echoed the sound of “gene,” using the Greek word mimeisthai (to imitate). Some memes are quite comical. Other quickly grow wearisome (remember the “dancing baby?”). One I find particularly creative is a scene of Hitler in his bunker during the final days of the Third Reich. The dialog is in German, and the ingenuity is manifest in all of the hilarious subtitles that people create to coincide with the actions of the characters. I’m sure there are many tasteless examples (to be avoided), but during the last few years I’ve viewed a couple of dozen and found most quite entertaining. During the Second World War, Lewis supported the war effort from home. He provided tremendous encouragement to his countrymen via well-received talks broadcast on BBC. And this is the inspiration for my “take” on the Hitler Bunker meme.
. . . it would be vain to deny that the human souls on whose anguish we have been feasting tonight were of pretty poor quality. Not all the most skilful cookery of our tormentors could make them better than insipid. Oh to get one’s teeth again into a Farinata, a Henry VIII, or even a Hitler! There was real crackling there; something to crunch; a rage, an egotism, a cruelty only just less robust than our own. It put up a delicious resistance to being devoured. 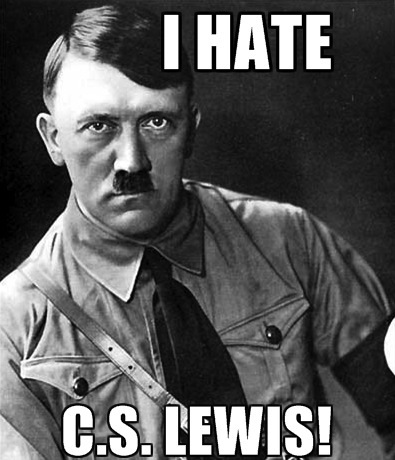 Curiously, in English Literature in the Sixteenth Century, Lewis mentioned how Hitler could be viewed in a humorous light. The mixture of farce and terror would be incredible if we did not remember that boys joked most about flogging under Keate, and men joked most about gallows under the old penal code. It is apparently when terrors are over that they become too terrible to laugh at; while they are regnant they are too terrible to be taken with unrelieved gravity. There is nothing funny about Hitler now. Lewis’ point, accurate I believe, is that in the terror of the experience itself, humor can provide some relief. Laughing in ridicule at the source of the horror can help to preserve our sanity. Only in the aftermath—once the threat has been dispatched—can we allow the true magnitude of the carnage to be comprehended. And, in that moment, there is nothing at all that is funny. Of course, years later, when the sights and smells of Dachau are no longer recalled by the living, things shift once again. (Very few of those tragic victims or liberating heroes remain.) When the scarred battlefields have been covered with velvet grass, and it was no longer even “dad’s war,” but now “grandpa’s” or even “great-grandpa’s,” the bitterness has grown stale. Today, it is natural to scorn and laugh at the tragic dictator who caused so much sorrow. He was a pitiful human being, and without minimizing his crimes, it is fitting that he be ridiculed once again. The fact that at a certain point it becomes acceptable to ridicule a monster, is the premise behind the hilarious film “The Producers.” If you’ve never seen it, by all means take a moment to watch the theme song, “Springtime for Hitler.” For a cinematic example of Hitler-ridicule, there may be none finer than that “musical” (overlooking the tasteless burlesque costumes). Of course, true to Lewis’ maxim, ridicule was also heaped upon the “Bohemian Corporal” during the war itself. The classic example would be Charlie Chaplin’s celebrated “The Great Dictator.” (In addition to starring in the film, Chaplin wrote, directed and produced the movie. Oh, and he also co-composed the music.) The film was made in 1940, while war already raged, but prior to the entry of the United States. The Three Stooges actually beat Chaplin to the screen with their short, “You Nazty Spy!” The sequel, “I’ll Never Heil Again” was released the following year. And finally, returning full circle to the original meme in which I participated, I was surprised to discover a version of it in which Hitler views the trailer for the 2012 Three Stooges movie. (Apparently, despite their rather disrespectful treatment of him, according to this meme der fuhrer was a fan!) And with that, today’s Hitler cinema will close. Terrible things are happening today in Syria. Yesterday, over lunch, I “debated” one of my sons regarding the merits (and drawbacks) of American intervention in that Levantine cauldron. He believes we can’t “stand by” while the world watches as a civil war rages around another of the world’s mad dictators. I argued the United States isn’t morally responsible to serve as the world’s guardian of peace. And, even if we as a single, fallible, divided people were accountable . . . what about the violence and injustice in so very many other places. Sudan, Myanmar (Burma), the Congo, and scores of other lands cry out for intervention on behalf of the oppressed. There is an almost unlimited amount of injustice around the globe today. And, looking in the mirror, it’s evident we have problems to resolve right here. 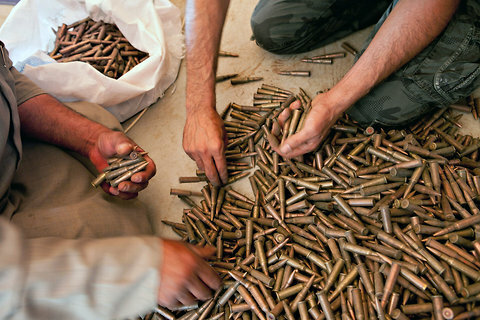 Sending American troops to intervene in foreign civil wars is ugly business. Taking sides against dictators does not always provide a safer and more just world—we need look no further than the so-called Arab Spring to reveal that. I was proud to serve my nation—and causes I believed in—during the liberation of Kuwait and the retaliation for the September 11 attacks on the United States a decade later. I am now retired from active duty, and I’ve lived long enough to witness how little positive fruit seems to follow war. If war is ever lawful, then peace is sometimes sinful. At the same time, however, war is something into which we should never rush. It demands our conscious consideration of the cost and an accurate determination that the blood spilled—include that of noncombatants inevitably caught up in the horror—is a price worth paying. It is that question which moral men and women must debate and ponder. “Learning in War-Time” is a brilliant essay included in the collection which goes by the name of Lewis’ speech, “The Weight of Glory.” In the essay, Lewis discusses the seriousness of war. As a combat casualty during the First World War, he vividly understood its nature. However, as a Christian, Lewis recognized that warfare is not the worst thing that can befall a human being. What does war do to death? It certainly does not make it more frequent: 100 percent of us die, and the percentage cannot be increased. It puts several deaths earlier, but I hardly suppose that that is what we fear. Certainly when the moment comes, it will make little difference how many years we have behind us. Does it increase our chances of painful death? I doubt it. As far as I can find out, what we call natural death is usually preceded by suffering, and a battlefield is one of the very few places where one has a reasonable prospect of dying with no pain at all. Does it decrease our chances of dying at peace with God? I cannot believe it. If active service does not persuade a man to prepare for death, what conceivable concatenation of circumstances would? Yet war does do something to death. It forces us to remember it. True. To die at enmity with God is a fearful thing. Still, even better than coming to faith during war (Lewis would surely agree), is recognizing God’s love and living a life of peace.